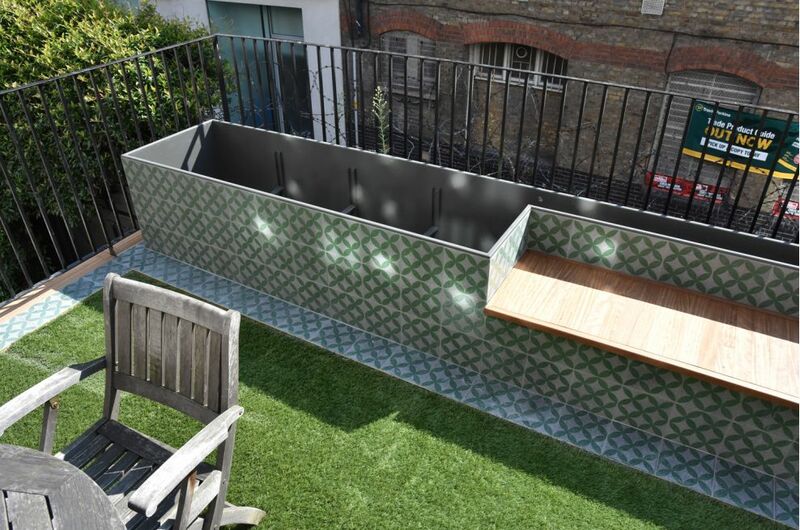 A bespoke steel planter / bench, clad in terrazzo tiles, was commissioned for a residential terrace garden in Old Street, London EC1. 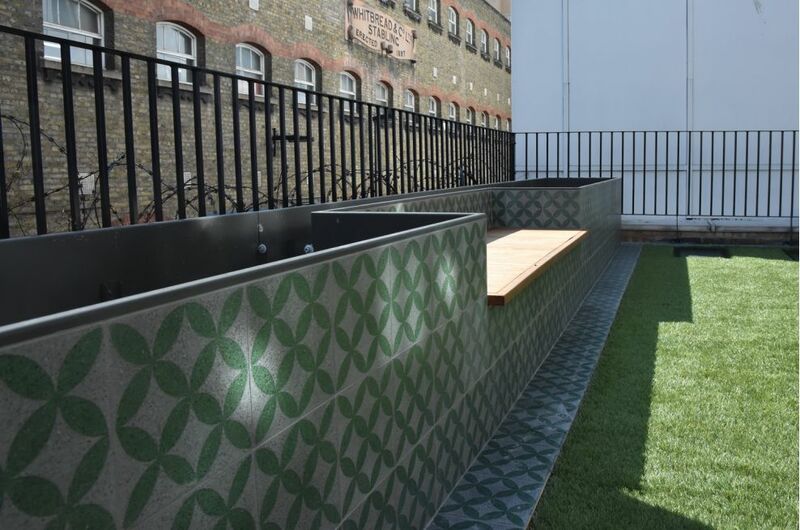 Art Deco inspired terrazzo tiles were the central decorative motif of the garden terrace design. 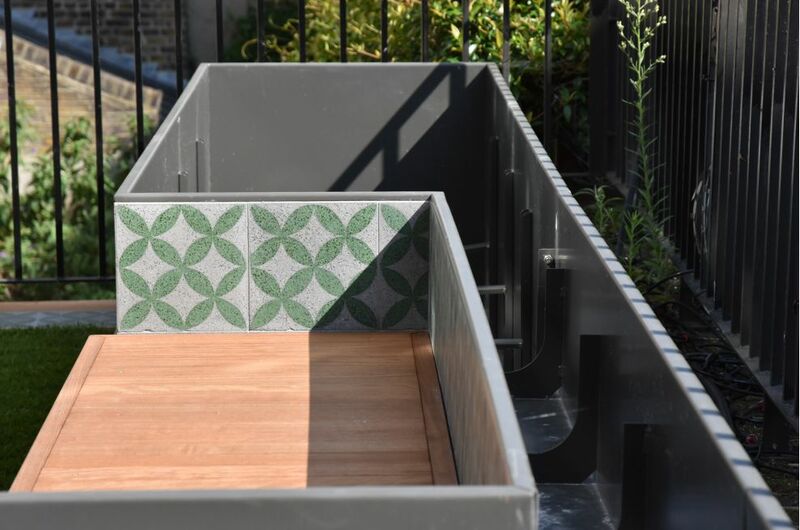 The tiles are used to border the terrace, and to edge steps leading onto the terrace; and the design carries this motif through onto the planter / bench, which creates the visual focal point of the terrace. The structure was originally conceived as being two separate components: an outer box section in timber and marine plywood, to be fabricated on-site, and tile-clad; into which would be inserted 5nr. 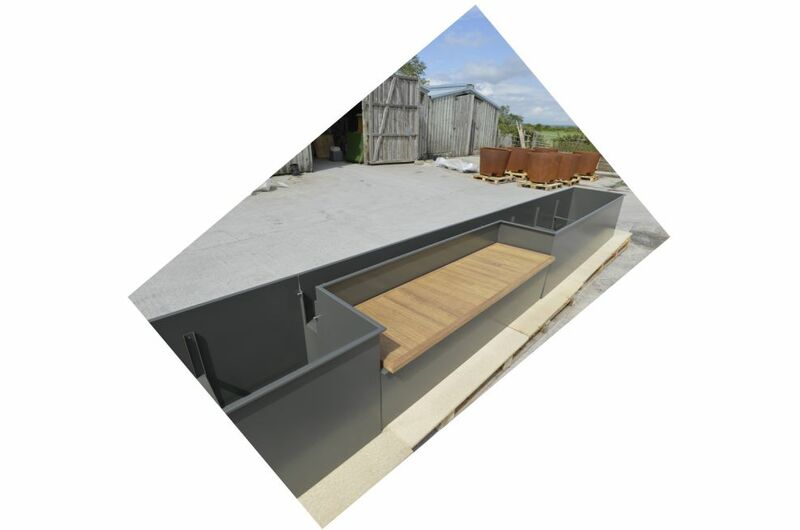 separate steel planters. IOTA proposed an alternative solution, based on fabricating the entire structure off-site in steel, with only the tiling to take place on-site. The proposed solution yielded several benefits: it was cheaper overall; it entailed less contractor time on-site, and disruption to the client; and the overall structure, in steel, was stronger, stiffer, and less subject to distortion and weathering over the long-term. Construction development and detailing was conducted jointly by IOTA and by the commissioning contractor, Allstruct Develpments. The overall structure was of dims. L 6617 x W 668 x H 604mm, comprised of 3nr. sections of Lengths 2184, 1846 and 2587mm respectively. 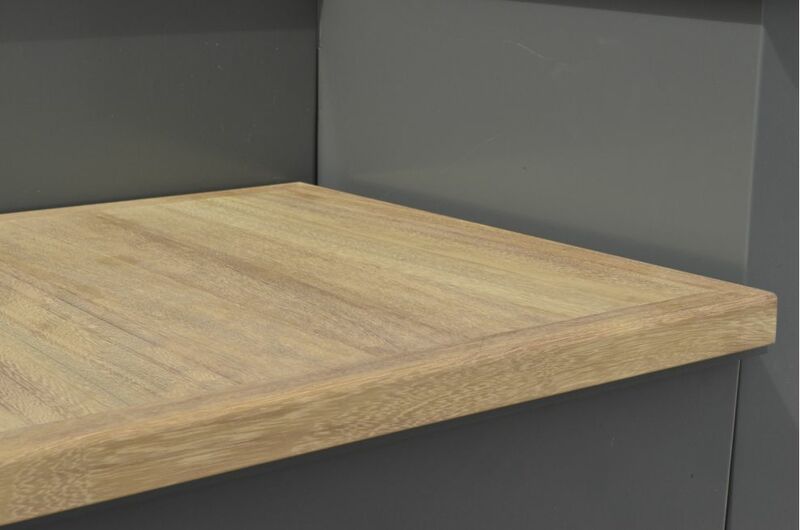 The central section was open at the base, to accommodate air conditioning plant underneath, accessible via a removable Iroko FSC timber seating section of L 1793 x W 528 x H 30mm. 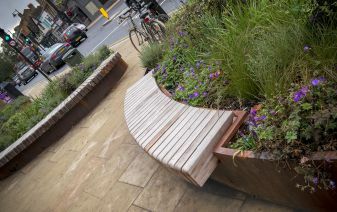 The planting flowed continuously between the 3 sections, wrapping behind the seat in the central section. 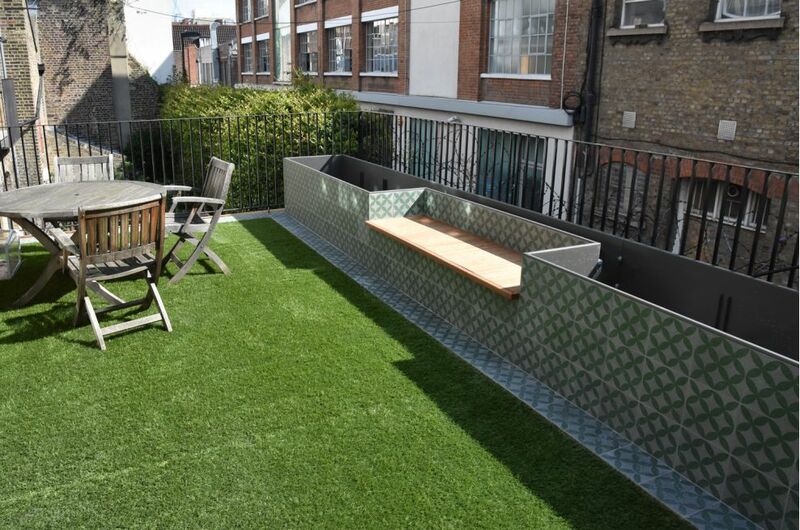 Tiled edges were all capped in steel, with all steel powder coated to RAL 7022 [Umbra grey] in matte finish. The garden terrace formed part of the renovation of a historic Georgian warehouse into a private residence. The warehouse’s varied history, associated with the Whitbread Brewery, was fully respected, with exposed brick walls, original oak flooring and beams all retained. 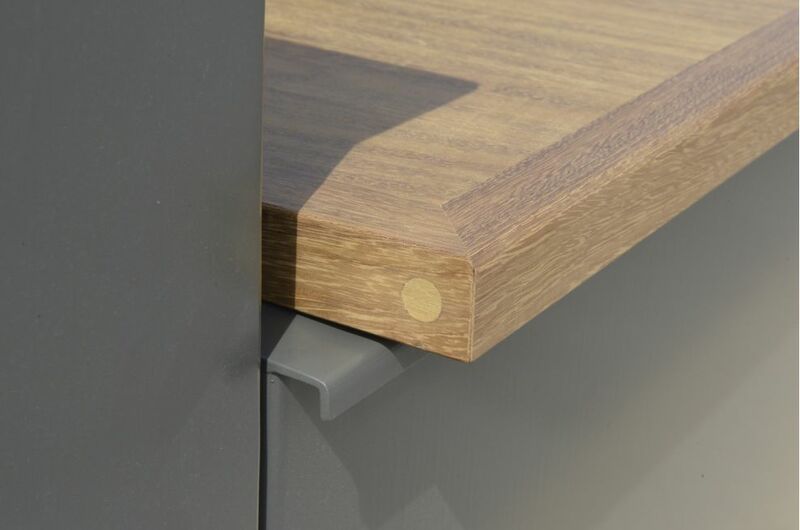 The architects on the project were Charles Tashima Architecture, and the contractors Allstruct Developments Ltd.